Was für ein herrlicher Spaß! Wer von den Stabs und Sounds der Hits von vor fast 30 Jahren noch immer nicht genug hat und immer noch nicht von Platte gerippt hat, kann sich jetzt ne Menge Zeit sparen: Eine 128 Presets umfassende Orgie an Oldschool Sounds bietet Rave Generator als Plugin für alle Systeme, sogar Linux! Neu in Version 2 ist, das man jetzt eigene hinzufügen kann. 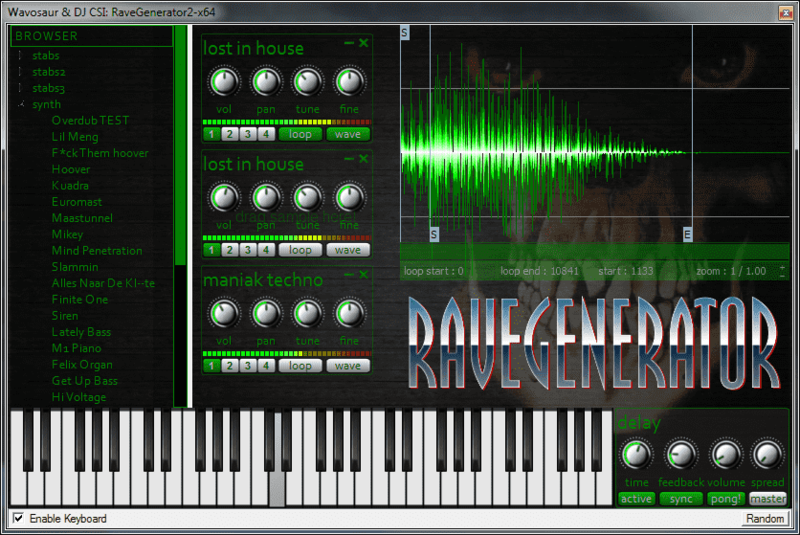 *Mac OS X, Windows and Linux compatible VST ! + AudioUnit version for Logic users. *up to 147 internal sounds. *sampler vs rompler : you can load your own samples ! you can layer samples (up to 16 sounds). *multi timbral : you can assign different MIDI channels to each sample. *editable / automatable loop points per sample. tune/pan/volume + volume & pitch envelope per sample. *AKAIZE effect from hell for your speed garage time-stretched vooooiiiicccceees. *reverse, awful delay, green colors, working embeded keyboard.